Hope you still got money left after the Blogger's Bazaar last Friday, coz here's another bazaar you shouldn't miss. :) Comment below if you want to get in for free! 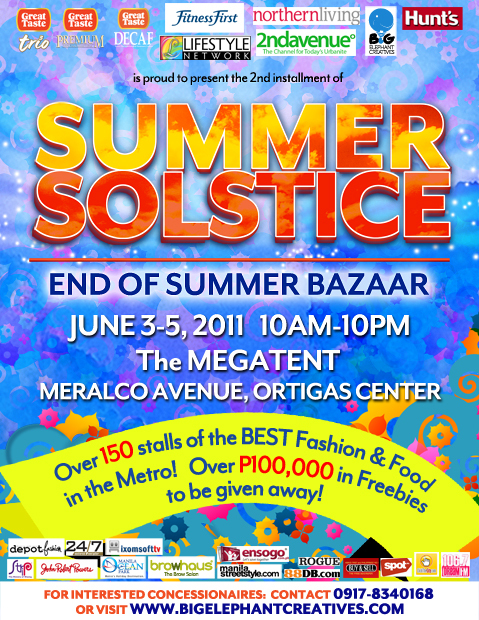 The Summer Solstice Bazaar is back with its second installment this June 3-5, 2011 at the Megatent along Meralco Avenue, Ortigas Center! With over 150 of the BEST Fashion and Food in the Metro and over P100,000 in freebies to be given away, this will surely be the best last summer get-away! and freebies from our amazing brands! P.S. The winner of my SHOPBOP + Theyskens giveaway is Jamie Chua! Tweeted you Jamie!